Yes, I\'ve heard most of these and \"Oh, I forget too, or I do that too,\" dismissals of my injury. It hurts to hear these things, because I can feel inside my brain where I can\'t get it to work. I wrote poems to deal with the hurtful things people say, to deal with the losses I suffered after TBI. Now I have a book out that is helping people find words for losses after BI and hope for creating a new life! Doctors are giving it to patients!! Sadly, I still hear these things. We have to teach the world about BI, so others receive the compassion that helps us heal from devastating losses. For every person who has had a TBI. Thank you soooo much for sharing your thoughts and feelings. You are right! We don't understand. I am a speech language pathologist who works in part treating TBIs and in addition had the trauma of my husband experiencing a frontal lobe TBI in 2004 and at times I still just don't get it. But as a therapist I try to help people find and do what works. As a wife and MOM I just try to love and be supportive. Please don't stop telling your stories. WE CARE and need to know. The anger has lessened and is still improving. The preplanning and hope has improved. The initiation is still lacking but my love and acceptance is growing stronger every day and I need your stories. Thank you. I get those days, Oct 12, 9:50. I have nothing but love and Sympathy for my fellow TBI survivors.. My accident was back in 07\'.. seems like yesterday though, and it has impacted my career path, etc.. I am not everyones bestfriend.. people just don\'t get me, get pretty aggressive after angered while drinking, and have NO DIRECTION. I feel like such a disappointment! Stuggling to keep my head above water as I jump from job to job! Recently my boyfriends mother told me that I needed to move on from my TBI cuz it was only holding me back. She says that holding onto it is doing nothing for me and wonders where it will get my family, ugh! I took it pretty hard! Currently, not drinking much alcohol, waiting tables and trying to find a job where I can help others in the community! I get angry when I hear "Make a list" or "Use Post Its." All it tells me is that they don't get it and I'm back at square one. Great info. 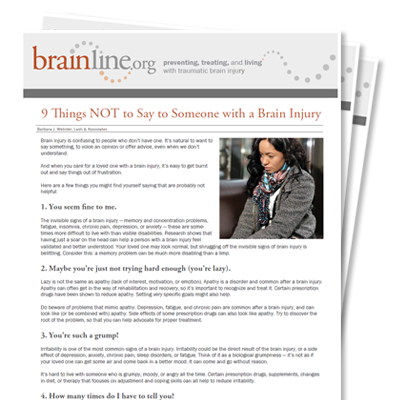 I\'d add #10: \"Everyone forgets things.\" There is a big difference between forgetting something and not remembering something because of a TBI. when i was 11, i got hit by a truck 2 times(the same truck. i only remember waking up in a hospital, with no memory!. i only knew my father, not even myself. the tbi left a serious impact on my life still to this day i can honestly say it got the best of me. i wanted to play football when i got older but couldnt pursue it due to my tbi. it changed my life damatically and have no choice but to cope with it cuz its more than 10 years later and still have most of the problems, therapies only helped a little. i get migraines and seizures and its not fun. i would say the worst thing to tell a tbi patient is that they will be ok cuz when it all comes down to it, its not and people get angry for that reason. This is all too true! I suffered a TBI in 1995 and I got so sick of people telling me I was lucky to alive. I would think, "No I am not. I'd be lucky if I was dead because living with an injured brain is pure hell. You have no f! @#$%^ clue how s! @##$ this is!" Then I would be pissed-off and depressed, so DON'T TELL SOMEONE WITH A TBI THAT THEY ARE LUCKY TO BE ALIVE! I have had two tumors removed and my ongoing symptoms is forgetting things. Probably more severe than I admit. I just do not let things bother me (most the time). I have tbi and I have heard these comments so many times because people do not understand tbi. This article made me laugh because it is true. The only people who understand arethe ones who are educated about tbi. I have a friend who was educated by his girlfriend ( she works with tbi ) and he told me he had no idea how difficult it is to live with tbi. This made me happy to be understood. It feels good to have recognition for living with tbi. Thank you! This article, and the comments are great! Don't EVER start a question with, "Don't you remember?..." My family has worked very hard not to use those 3 words with me in the 16 yrs. since my brain tumor was removed and the 4 years since officially getting the "memory impaired" diagnosis. My husband's brain injury was in 1984 this is still true today. Also I would say memory issues are common to us with a TBI, and when we forget something a loved one might say, "Oh, I forget things too. Don't worry about it." Nobody's memory is perfect but a TBI survivor that forgets where he/she parks their car every time or always forgets the name of a new person this is an unfortunate everyday experience that causes us much grief. Don't try to empathize with a TBI survivor's problem if you have never had a TBI, it is demeaning and causes more anger and frustration. Retpe it on a Word document and add it via a photo upload. I get these comments alot from my kids, they seem to forget that a Stroke is a brain injury and they know the answers to all of this, they were warned my personality would change and I would have good days and bad drays, but I know my good and bad ones and when to stay home and let things heal and respond to my own living kindness. Some times we don't believe we are lucky to be alive at that particular moment for a brain injury robs you of many things. It you are lucky enough to survive, you will understand those days that you feel like staying home and not opening the door . Some TBI patient's cannot handle a great deal of ambient noise or light. I would love to share this on facebook, it totally describes what people say and have said to me, especially the "you seem fine". However when I try to share, I get the message that Java Script is not enabled. Is this a facebook problem, should I try later. I love the article so, I want to share it.